The following is a summery of the e-mail exchange that documents this wonderful addition to the Bradlee family collection. In October 2001 I received an inquire from Col. Lynn B. Moore, USA Retired, the following is reprinted with his permission. "Noticed your e-mail address at the bottom of the Bradlee Genealogical Society web site, so I assume you are welcoming inquiries. 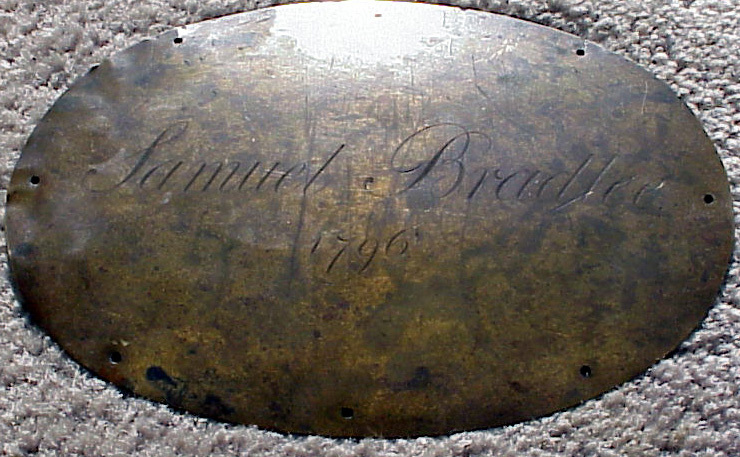 I have no connection to the Bradlee's, however, some 40 years ago I acquired an oval brass casket plate marked Samuel Bradlee - 1796. It's approximate size is 8 1/2" X 6", hand tooled and engraved in a Revolutionary War style English Script. I assume the 1796 is the date Samuel Bradlee died. I have been unable to identify him as belonging to a listed ancestral file. As I am fast approaching 80 years of age I thought I should try and find someone who have might have an interest in it." In responses to my excited 6W's (Who, What, When, Where, Why and Wow), the Good Colonel, provided the following information during several e-mail exchanges. "In my youth I was a Funeral Director and Embalmer down in Texas. During my Army career, lasting some 30 years, World War II, Korea on thru Viet Nam, I always retained an interest in Mortuary associated items. I collected clocks for 45 years or so, but still picked up things relating to the funeral business. I believe I picked up Bradlee's plate during a clock excursion trip near Grafton, Mass about 1956. It was in an antique shop near the Simon Willard Clock Museum. Antique Shops end up with all kinds of funerary items, caskets, grave markers, just about anything. I thought it was unusual because it was of brass, large size and fancy engraving. I do think 1796 was Samuel Bradlee's death date. He must have been a substantial member of the community. As you surmised no child would have had such a large name plate. For that time period, just after the Revolutionary War, brass was scarce and expensive. 99% of such name plates would have been of lead, as they are today. In all likelihood this is the actual plate off of a casket that contained the body of Samuel Bradlee. What usually happens is that the burial was in a small isolated or family plot which was completely forgotten or uprooted for some reason. Road, river course change, embankment cave-in or just plain malicious vandalism. A lot of land owners purposefully want isolated burials to disappear, especially if that plot is incorporated into cities and the land becomes valuable. Sadly this is happening every day. Further, many times the only remaining evidence of the burial was the name plate which served the same purpose as the head stone." On September 1, 2001, I received a package containing Samuel Bradlees casket plate, along with a short note. Enclosed is a little something I thought you might be able to identify and fit into your Bradlee Family Tree. Keeping in mind what a friend told me one time, "CASKETS HAVE NO POCKETS". Samuel Bradlee's Casket Identification plate is now yours, I don't think I will be taking it with me. PS: Authenticity is lost by cleaning and polishing so I left it as I found it." 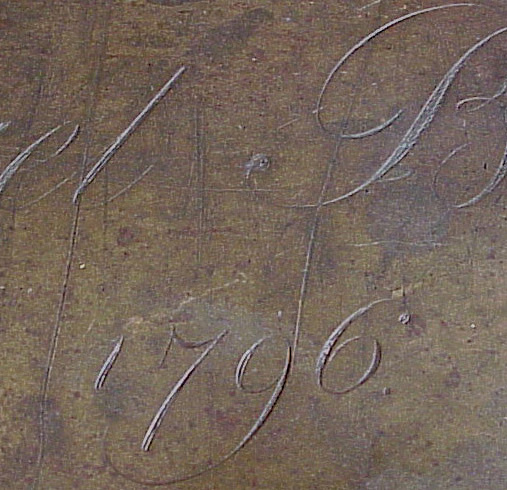 Even though I digitaly enhanced the patina of the "Headline" photo to increase both contrast and detail, I have attempted to capture the natural look of the brass for this untouched closeup of the engraving. I once again want to express my gratitude. Colonel Moore is a true example of an officer and gentleman. The entire Bradlee family is indebted to him for his thoughtfulness. I now leave it up to the "Boston Bradlees" to figure out which Samuel Bradlee died in 1796?